The 2018 European Championships, held in the pleasant North German resort port of Warnemunde, proved no exception. Many sailors don’t like to finish the race, preferring to miss out the finish gate, or a mark on purpose, believing it to be bad luck or some such. Again, nothing new here. The 3pm race was held in a slowly dying breeze. However, the previous two days has been blowing dogs off chains, with 33kts recorded on the harbour wall. This left the sea state rather lumpy, with 1.5m waves still rolling in. This meant that upwind foiling proved to be a great way to loose a few dozen boatlengths, as the waves negated any net benefit gained. Downwind was a little better, the good foilers managed to pick their way between the larger waves, and if lucky, managed to avoid the large lumps of floating seaweed. The left side was favored showing acceptable gains over the right of the course. On the third lap, the breeze was down to about 7kts and many boats had dropped into deep, low-drag mode, but the ones who mastered the marginal foiling made handsome gains in the end. 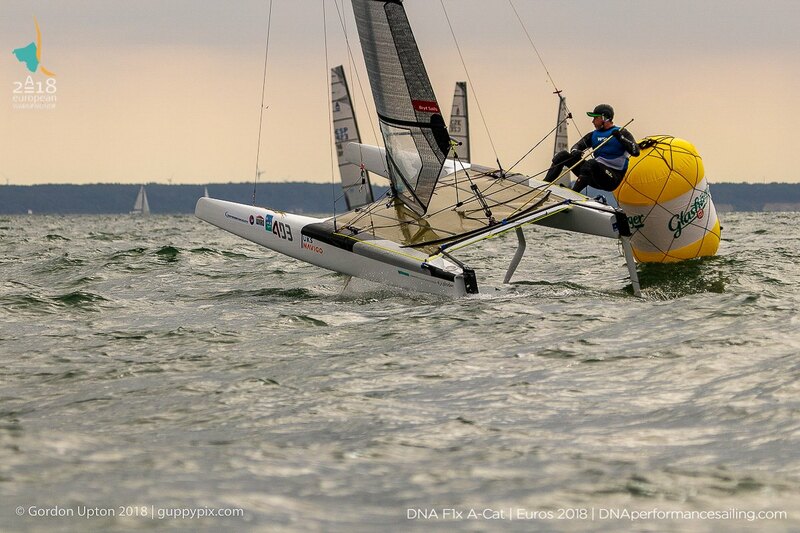 First around the top mark was GER Helmut Schtumhofer, however, he was soon caught by Michal Korneszczuk, who led at the bottom from Marciej Zarnowski and ESP Manuel Calavria with GBR Adam May chasing. Next lap, Zarnowski had taken the lead, with Calavria closing in. Last lap was he had pounced and would have won had he crossed the line. Calavria looks like the man to beat judging from his smooth efficient style, and a win at this event would be long overdue for this Spanish Champion, who has always been the bridesmaid in the last few championships. Glenn Ashby, in his welcome return faired less well. His new DNA F1x rudders came apart, one breaking off, the other delaminating, causing his retirement. Mischa Heemskerk joined in the race halfway and seemed to be going well as usual, however, Glenn’s breakage could be a cause for concern if it is a serial issue. Monday, the proper racing starts, however, the forecast is rather ‘fruity’, with 18-23kts predicted, so many expect it to be canned. Fingers crossed.